In just a few weeks, redbay ambrosia beetles will be on the move in Florida, a major concern for the state's multimillion dollar avocado industry. 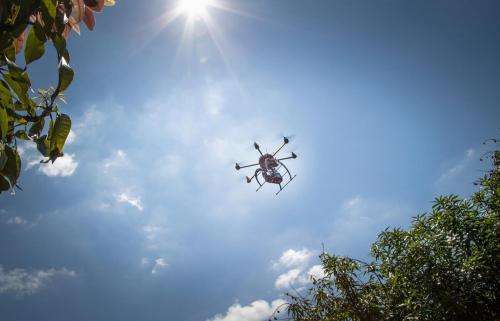 Florida International University (FIU) researchers believe a combination of drones and dogs could be game-changers in the fight to stop a deadly fungus spread by these invasive pests. The beetles, which first appeared in the United States in 2000, carry the fungus Raffaelea lauricola, which causes a vascular disease in trees called laurel wilt. With devastating effects on avocado groves, more than 90 percent of trees die within six weeks of infection. Detection is a major challenge. Diseased trees can begin to wilt within two weeks, and by the time symptoms are visible, the fungus has likely spread to nearby trees via root grafting. This is a particular problem in commercial groves, where trees are planted close together. 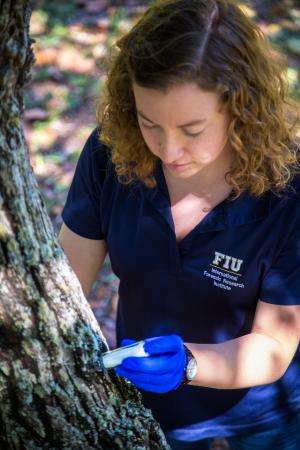 As part of an FIU research program, three specially trained canines were recently deployed in a grove where the beetles were suspected. 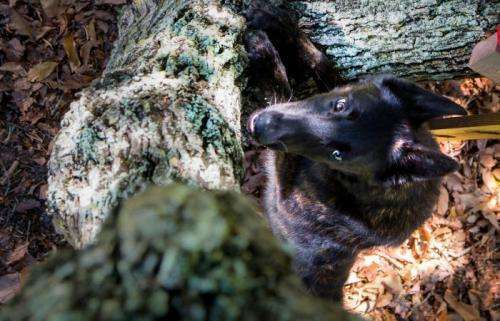 The dogs identified three infected trees, though the trees were not yet showing symptoms. FIU Provost and Executive Vice President Kenneth G. Furton and Biological Sciences Professor DeEtta Mills have developed the detection program, which couples drone surveillance with canine scent detection. Furton, a forensic chemist, has spent most of his career studying scent and canine detection. Mills, a forensic biologist, specializes in DNA research. "This isn't just a Florida problem," Furton said. "From California to Latin America, there are growing concerns about how to respond to this aggressive disease." FIU's hunt begins with the drones. The vehicles carry thermal digital imaging instruments that search for stressed trees before symptoms are visible. However, the drones cannot identify the cause of the stress. Canines have up to 50 times more olfactory receptors than humans and can be hundreds to thousands of times more sensitive to detecting odors. By using drones to isolate areas of concern, it provides manageable areas for a dog to search. The research team includes a certified dog trainer, drone operator and FIU graduate students. Of the recently deployed dogs, all alerted to the same three trees in the commercial grove during separate searches. Students from Mills' lab conducted DNA tests on samples to look for the laurel wilt fungus. The DNA tests confirmed the trees were infected, meaning the dogs detected the pathogen much earlier than any other method available. Currently, diseased trees must be removed, along with surrounding trees. More than 6,000 of Miami's 74,000 avocado trees have been destroyed due to laurel wilt. But early detection could mean fewer surrounding trees would require extraction. In some cases, diseased trees could even be treated if the laurel wilt is detected early enough. The research is funded by the Florida Department of Agriculture and Consumer Services. Furton and Mills believes the unique detection program could have far-reaching applications for the entire agriculture industry.